Entrance Hall: - Accessed via the front door, with storage heater, airing cupboard with tank and shelving, loft access hatch. Kitchen: - 2.85m x 2.70m (9'4" x 8'10") - Fitted with a range of modern base and wall units with built-in electric oven, hob and extractor, space and plumbing for washing machine, space for under counter fridge, tile splash backs and tiled floor, extractor fan, storage heater and external door to side. Dining Room: - 2.86m x 2.60m (9'5" x 8'6") - With storage heater and window to side. Lounge: - 3.90m x 3.60m (12'10" x 11'10") - With electric fire, coved ceiling, TV point, storage heater and patio doors to rear garden. 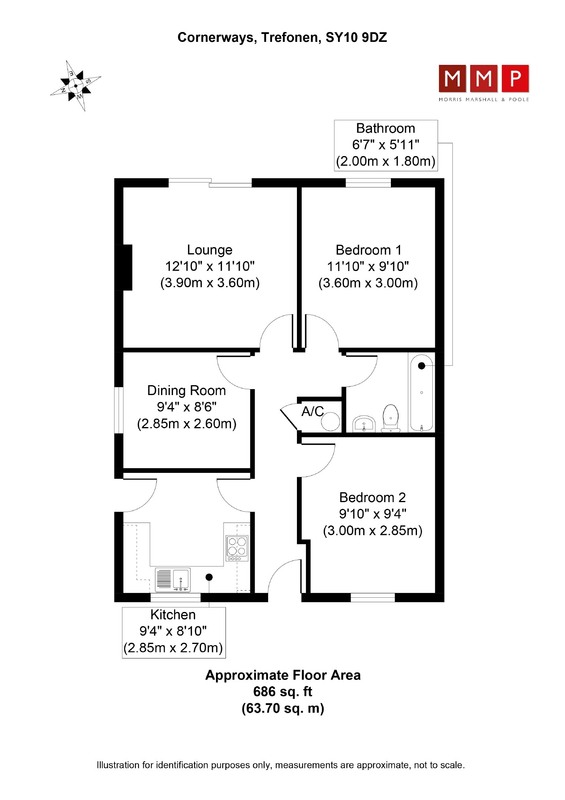 Bedroom One: - 3.60m x 3.00m (11'10" x 9'10") - With window to rear, storage heater and range of bedroom fitments. Bedroom Two: - 3.00m x 2.85m (9'10" x 9'4") - With window to front and storage heater. Bathroom: - 2.00 x 1.80m (6'7" x 5'11") - With a three piece suite comprising panelled bath with electric shower over, pedestal wash hand basin and WC, part tiled walls, vinyl flooring, shaver and light socket. Outside: - Occupying a corner plot the garden to the front and side are laid to lawn with inset pathway to front door. The enclosed rear garden is laid to lawn. There is a single garage and parking located to the rear accessed off Martins Fields. Services: - Mains Electricity, water and drainage services connected. Electric heating. None of the services, appliances, central heating system, chimneys flues and fireplaces have been checked and no warranty is given by the Agents. Council Tax: - Council tax band (B) payable to Shropshire Council. Directions: - Leave Oswestry via Upper Brook Street and Trefonen Road and continue to the village. In the centre of the village at the crossroads the property can bee seen on your left hand side and indicated by the agents board.